Along with a host of other players at the 610 Fan Fest, I got Kasey and James Kirkendoll without ever setting foot at their table because they were walking around the floor among the crowd. A savvy fan pointed him out, and I was able to go over and score his autograph saving me precious time. I liked this picture of Studdard. They never made a card of him, but I thought this picture captured him in all his glory and grit, and would be perfect for him if they ever did. A popular member of the Longhorns squad, Kasey is considered the model of aggression and grit that fans love from offensive linemen. 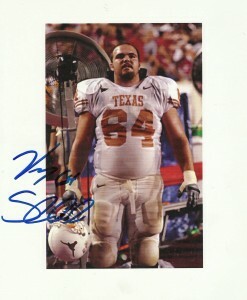 I am very surprised that Upper Deck didn’t make a Longhorn card of Studdard, but I guess that will have to wait for the ‘second edition’.